Q: Isn't the special ignition key with the anti-theft security system on my new car good enough? A: This anti theft system is factory installed on almost every new vehicle manufactured today. Most every manufacturer, whether domestic or foreign, uses this type system. Embedded in the head of the vehicle’s ignition key is a miniature RFID Transponder Chip which contains one of a trillion possible electronic codes. When the key is inserted into the vehicle’s ignition, the transponder sends a signal to a disc shaped antenna surrounding the key cylinder housing behind the shroud on the steering column. The antenna then relays a signal to the control module and if the signal is correctly recognized, the vehicle is allowed to start. If access is attempted without the correct code, critical systems (ignition, starter) remain inoperable. This all sounds good on paper but all this system does is keep honest people honest, because it is very easy to bypass. The thieves are now using laptop computers with recorded RF codes to bypass them in about 20 seconds, which is probably why the factory installs these systems for free. Sadly, many car dealers tell their customers that because of this special transponder chip in their key . . . they do not need any extra security for their vehicle, but this is NOT TRUE! Q: Will installing a Ravelco anti-theft device on my new vehicle void the warranty? A: No, this is NOT true! Many car dealers use this threat to frighten you into buying a more expensive anti theft system from them. Instead, tell them that you won't buy their vehicle unless they can provide a RAVELCO. Q: Why would I need a Ravelco? My vehicle already has a factory alarm. A: The remote "keyless entry" capability for locking and unlocking the doors of a vehicle with an alarm system is a great option to have, but as far as security is concerned, the remote control alarm system only interrupts the starter wire, and this can easily be bypassed under the dash. Electronic "code grabbers" or "scanner boxes" can defeat any alarm system made today in seconds! Even the alarms that claim to have Anti-Scan or Code Grabbing Technology were still defeated. This was demonstrated on a telecast of CBS' The Early Show and 48 Hours. 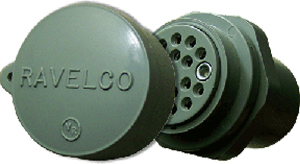 Q: Why is the Ravelco plug larger than most of the flat plug and key type anti theft devices? A: In order to maintain two separate major circuits and to handle the amperage put out by the electrical systems on today's vehicles, the RAVELCO cannot be made any smaller. Other anti theft devices offer only four to six different code combinations; THE RAVELCO HAS OVER 100,000! That is why it also has a ZERO FAILURE RATE! Q: Why doesn't the Ravelco have a "red flashing light" to help ward off thieves? A: There are numerous vehicles stolen every day that have full blown alarm systems, including the ones with the red flashing warning lights, which proves that the only red lights that car thieves run from, are the ones on top of police cars! The RAVELCO system includes two warning labels that attach to each side window, warning of the device. No vehicle with the RAVELCO system installed has ever been stolen! Q: What happens if a tow truck tries to steal my vehicle? A: If you follow these two simple steps when you leave your vehicle, they can't! a) Remove the RAVELCO plug from your system. b) When you park your vehicle, turn your wheels all the way to the left or right and lock your steering column. In the event a tow truck tries to steal your vehicle, the angle of the wheels will make your vehicle track in a big circle. This attracts attention . . . and no tow truck driver wants to tow a vehicle that is traveling beside them two lanes away! This will make the tow truck driver look for an easier target. Q: Does the Ravelco protect items inside the vehicle? A: No, and neither does an alarm or any other type of anti theft device. If a thief sees a GPS unit, a Radar Detector, a briefcase, a cell phone, or anything else of value inside the vehicle that he wishes to steal, he can easily break a window, take the item, and be gone within seconds. Nothing in the world other than a mean dog in the vehicle can stop a smash-and-grab thief!